Brussels, December 19, 2018:- The Our Fish campaign today slammed EU fisheries ministers for failing to end decades of overfishing during the AGRIFISH December Council meeting, after it closed at three o’clock this morning. The meeting – where annual EU fishing limits for the North Sea and Atlantic are agreed – concluded with continued overfishing of iconic fish stocks such as cod, herring and critically endangered eel. “This should have been the year in which fishing quotas finally followed scientific advice, and EU fisheries ministers made history by ending overfishing in EU waters. Instead, we saw another absurd all-night meeting behind closed doors, where ministers haggled over fishing quotas like kids trading football cards. By choosing to set fishing limits above scientific advice for many stocks, they have ignored European citizens and all of the evidence that shows ending overfishing will deliver healthy fish stocks, more jobs and security for coastal communities”, said Rebecca Hubbard, Program Director for Our Fish. “Along with global biodiversity loss and climate change, overfishing is having a devastating effect on the ocean. EU fisheries ministers could have simply and immediately alleviated that threat by following scientific advice, yet they keep trying to negotiate the limits of nature. It’s time they faced reality, by acknowledging the destruction decades of overfishing has caused, and act on the responsibility invested in them by European citizens, who expected them to deliver a historic end to EU overfishing”. The reform of the EU Common Fisheries Policy in 2013 included a commitment to end overfishing by 2015, or by 2020 at the latest, however the latest assessment shows that over 55% of North Sea and Atlantic fish stocks are still overfished – experts have said that at this rate, the EU will not meet the 2020 deadline . The introduction of the ban on discarding fish at sea, or throwing unwanted fish back (called the landing obligation), is also being rejected by industry interests, who for the most part have refused to change their discarding behaviour . After today’s council meeting, iconic fish stocks such as cod in the North Sea, herring and eel remain under severe threat from overfishing. Instead of taking responsibility, excuses were given for not following the scientific advice. Three petitions collected since October 2017 collected over 350,000 signatures from EU citizens in support of an end to EU overfishing . Last week, Our Fish asked supporters to write to Commissioner Karmenu Vella and EU fisheries ministers, asking them to end overfishing during the December Council meeting. Almost 20,000 emails were sent to Commissioner Vella, and fisheries ministers in Denmark, Germany, Netherlands and Portugal. 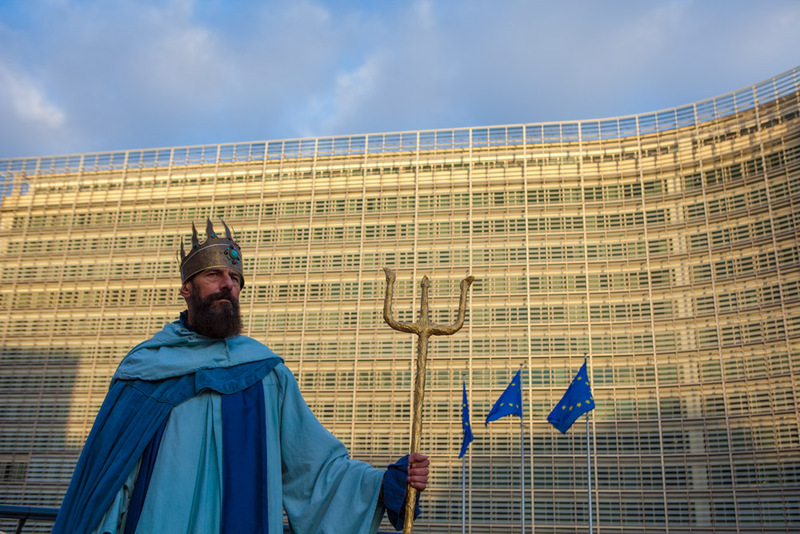 The God of the sea, Poseidon, and his Minister of the Ocean arrived in Brussels to deliver 350,000 signatures from EU citizens calling for an end to overfishing. When they try to enter an EU meeting where fishing quotas are decided – behind closed doors, Poseidon is locked out. Last week, the Our Fish campaign released a satirical animation lampooning the annual EU ritual of all-night deal-making and continued overfishing.The provocative video highlights the opaque deals on annual fishing limits and agreements made by EU fisheries ministers to fish beyond scientific advice – in other words, overfishing – during the Agriculture and Fisheries Council meeting. Scientific, Technical and Economic Committee for Fisheries (STECF) – Monitoring the performance of the Common Fisheries Policy (STECF-Adhoc-18-01). Publications Office of the European Union, Luxembourg, 2018. Scientific, Technical and Economic Committee for Fisheries (STECF) – 57th Plenary Meeting Report (PLEN-18-01); Publications Office of the European Union, Luxembourg, 2018.